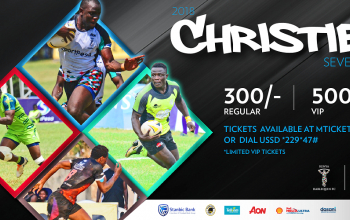 Two games in the division II category involving top seeds Masinde Muliro, and Nakuru KITI, will set the ball rolling at Christie Sevens, the sixth and final leg of the 2018 National Sevens Circuit, all at the Impala grounds on Saturday 15 September starting 7.42am. 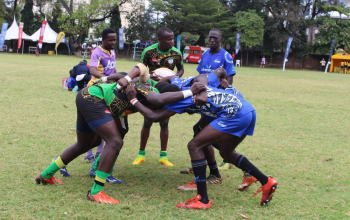 The two games will run concurrently at Impala, and while MMUST will take on Vandalsin one of the games, Nakuru KITI will face off with Administration Police. Right after, starting 8pm will be two pool B games when Stingerz and Blak Blad take on Citam Kisumu and BATUK, respectively. Defending Christie 7s division two champions Makueni take to the field at 9.12am for a showdown with Kiambu RFC in their title defense opener. To scoop the title last year Makueni beat Webuye 19-12. To reach the Cup final, Webuye beat Comras 26-12 while Makueni saw off? Catholic University 12-0. 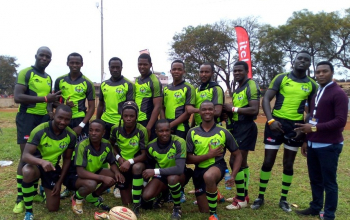 Division two series leaders Embu RFC (pictured), currently on 65 points after five legs of the circuit, start out against last years semifinalists Comras in a group F affair at 9.56am. Embu are a point ahead of Makueni in the overal standings. A total of 24 teams will contest the division two title and are banded in teams of four across six pools; A to F. Four others; Dagoretti BullDogs, Comras, Meru, Molo are all on standby.